If you’re like me and often find yourself scouring through YouTube for food videos before, during and after meals, you’ll want to check out Nom. 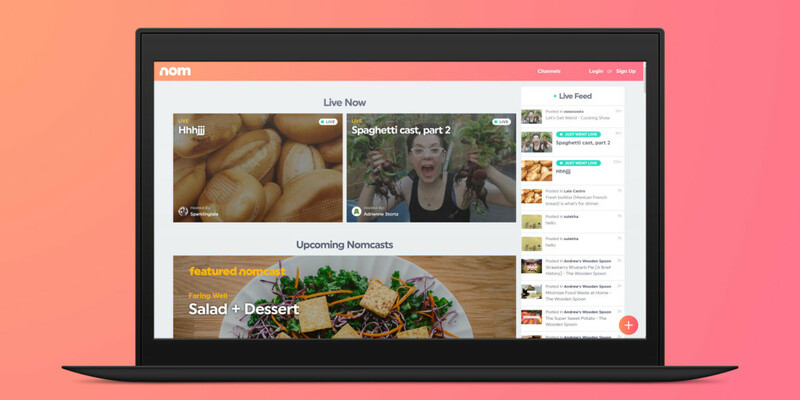 It’s a new livestreaming platform for gourmands, home cooks, professional chefs and anyone interested in the culinary arts to share their kitchen adventures in real-time. Similar to services like Twitch, Nom lets people broadcast from their desktop or iOS device. Viewers can interact with streamers using reaction buttons or through delay-free two-way chat. The idea is to get users to run their own live cooking shows and showcase food experiences around the world, such as meals at exotic restaurants. The homepage lists ongoing and upcoming ‘nomcasts’ for you to tune into and you can also browse channels to view older streams. You can also go on the air yourself in a matter of seconds or create a static post with pictures, links and text. In addition, you can also add recorded video, links and GIFs to your livestreams. That, along with an upcoming feature to allow you to use multiple cameras for your broadcast, should help make it a more attractive platform that existing services like Periscope. Given that Nom is brand new, I wasn’t surprised to find only a couple of active streams to check out. But it certainly looks like something I’d happily browse while munching on homemade pita crisps and hummus. The platform was launched by YouTube co-founder Steve Chen, who now serves as Nom’s CTO. The firm scored $4.7 million in funding from the likes of South Korean pop sensation PSY, actor Jared Leto, three-star Michelin chef Corey Lee and restaurateur Ming Tsai.